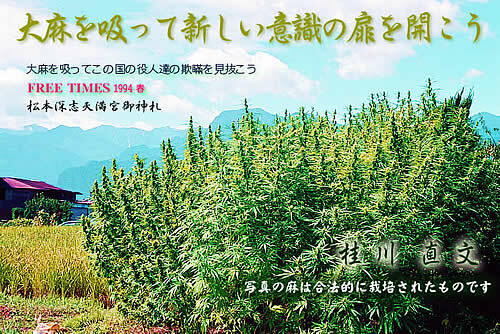 Taima (Japanese for cannabis) is Marijuana, which is hemp, also known as Asa, grown and cultivated for tens of thousands of years in our Japanese culture. Due to it’s strict laws against cannabis in general, the Japanese pot scene is deeply underground. However, it is estimated that over one million Japanese have tried cannabis in one form or another. This is due to excessive traveling done by the Japanese throughout the world, experiencing cannabis for the first time and bringing home the practice of smoking weed. The huge reggae and hip-hop scene in Japan contributes greatly to this culture as well.